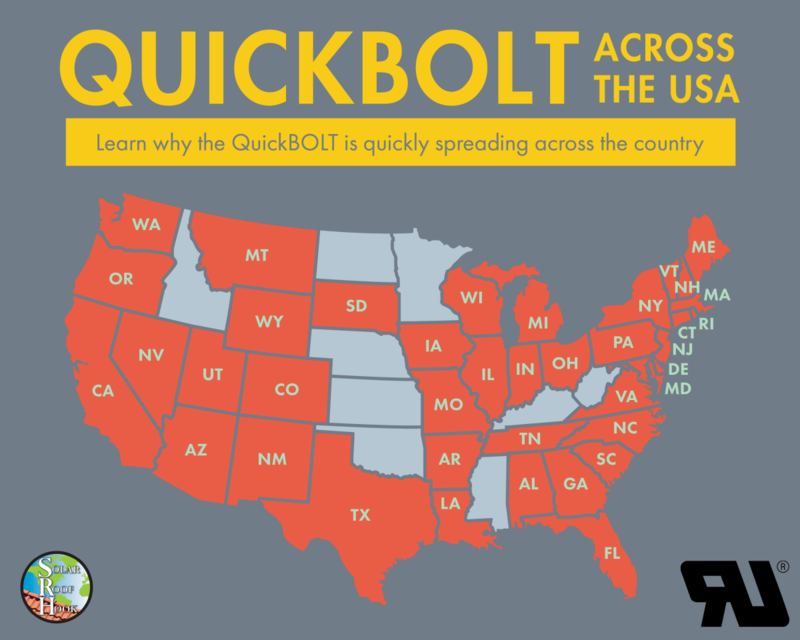 From local installers to nationwide installers, customers across the country have been embracing the QuickBOLT with Microflashing™. What are some of the factors that have lead to the QuickBOLT’s widespread installation? The QuickBOLT with Microflashing™ is a UL certified component. This stamp of approval from UL has made the QuickBOLT much more popular with local AHJs. Installers in counties that previously had issues with getting approval are seeing a simpler approval process. Our Customers are always amazed by how much time they are saving with the QuickBOLT. One of our customers in Georgia even went so far as to call the QuickBOLT with Microflashing™ a “game changer”. There are many factors that make the Installation process faster with the QuickBOLT, but the biggest one is that installers do not have to lift any shingles. The Microflashing™ is placed directly over the shingles and the compressed by the collar of the patented Bolt. Eliminating the need to lift shingles will save hours off your overall installation process. The QuickBOLT with Microflashing™ doesn’t just divert water, it seals the penetration, making it leak-proof. This is due to our revolutionary Microflashing™. If you would like a more in-depth explanation of multiple layers of protection included in the QuickBOLT, click here.